Processing the current request. Please wait. 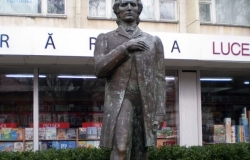 Mihai Eminescu is the most famous representative of the national poetry, known not only for every inhabitant of Moldova, but also internationally. Moldova has repeatedly been under the oppression of other nations, but each time fighting for liberation, acquired its military history. Here you can find information about military conflicts and battles, in which Moldova participated. Moreover you can learn the history of castles and other defensive structures and enjoy information with regard to the monuments and memorials of our nation. The army’s development begins with a regular military force of Moldavian principality "small army" and ends with today's armed forces in Moldova. The "Arch of Triumph" is dedicated to the victory after the Russian -Turkish War and it is located in the center of..
Alexey Iliych Belsky is the Colonel, Hero of the Soviet Union and an honorary citizen of the city Chisinau. The Obelisk is to Boris Glavan - an underground Komsomol movement, established in 1981. Memorial "Mass Grave" is a monument erected in the memory of the soldiers who fell in battle in 1944 in Tiraspol. Memorial "Glory of the Heroes - Liberators"
The city called Bender, situated on the river Dniester there is with the help of public funds a built monument in the..
Memorial Complex of Fallen Soldiers for the City's Liberation in 1944. In the 1920s on the place of the contemporary..
Memorial complex “Eternity” (in Moldovan language it sounds like “Eternitate”) in Soviet times was known as Victory..
Memorial Military Monument "Soldiers- Liberators"
Monument " Soldiers- Liberators " is installed in February 23, 1968 for the 25th anniversary of the liberation Balti.. The Teachers of Pedagogical Institute N.E .Vasilaty and I.E Borisiuk and thirty students did not return home from the..
Memorial Park of Culture and Recreation "Victory"
Memorial Park of Culture and Rest "Victory». It was set in 1947. Park "Victory" is the main park of culture and.. This Monument is commemorating the liberation of the city of Bender from Nazi invaders. This memorial is dedicated to the soldiers who heroically died for city liberation, as well to villagers who died..
Memorial to soldiers and civilians who died during the Great Patriotic War of 1941- 1945. Military memorial symbol is installed in 1975. The inscription reads as follows: ''Nobody is forgotten, nothing is..
Military Memorial Symbol in Memory of Soldiers - Aviators was established in order to commemorate the 30th Anniversary.. This monument was established in memory of workers of Tiraspol canning food factory named “The 1st May”. These people..
Monument to the legendary Soviet military leader G. I. Kotovski, who was born in an ordinary family, with a strong,.. This monument is to the founder of airborne troops of the USSR General Margelov. Monument to a valorous general, a hero of World War II in 1812 M.F. Orlov was established in 1975 for the 150th..
Monument to peaceful Tiraspol citizens, died in military conflicts of the 20th century. Monument to Serghey Lazo, a hero of the Civil War. Monument to the "Victims of fascism"
The Russian Embassy in Moldova supported the initiative of the Jewish community of the Moldova Republic to restore the..
Titular councilor, Mr Herz, built the house in 1903. One of the oldest monasteries in the Republic of Moldova is the Orthodox Holy Assumption Monastery Capriana. It is..
© 2019 Prospect.md. All Rights Reserved. Using materials of the portal prospect.md for commercial purposes is not allowed without prior written permission of the administration. When copying materials reference to prospect.md is required.